Specializing in distinctive, sophisticated, innovative cuisine, Glatt Kosher Touch Catering will transform your event into a multi-sensory social experience. They will take care of all the wedding details, so you can enjoy the most memorable day of your life. Get more for your wedding! 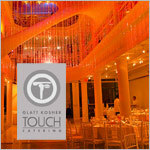 Don't forget to mention ChossonKallah.com when visiting Glatt Kosher Touch Catering.